Italy sent up concentration camps throughout Libya to repress the anti-colonial movement. 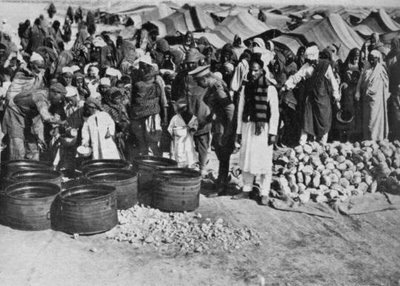 Ten thousand Libyan inmates were kept at the concentration camp in El Agheila, above. 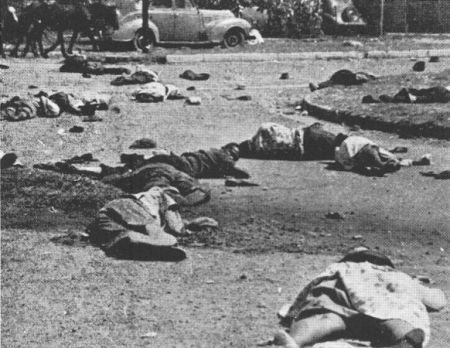 In 1960, 69 South Africans were killed and 186 were wounded, with most shot in the back, after a protest against apartheid. The U.S. and European powers remained the primary supporters of the apartheid regime. 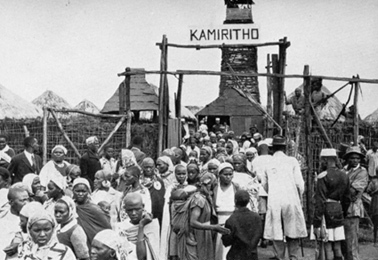 In the 1950s, British colonizers put Kenyan communities into "protected villages" (in reality, concentration camps) to keep them from joining and aiding the guerrilla struggle. The following is adapted from a speech given by Jeff Bigelow, on behalf of the ANSWER Coalition, at an Aug. 19 meeting in St. Louis organized to oppose the war on Libya. As indicated in the opening remarks, this meeting is a commemoration of the life of Marcus Garvey who was born just about on this day—on August 17 in 1887 and it’s a meeting that represents a re-dedication of our commitment to the struggle today. Marcus Garvey was born in August 17, 1887 in Jamaica and became a citizen of the world. He was able to inspire great masses of people in ways that others only aspire to. He was famous for giving uplifting speeches and for his ability to expose racism, injustice and imperialism. But more importantly he was able to inspire people to join an organization, to create an organized powerful voice for millions who had none. He challenged the British Empire throughout to Caribbean and he challenged the U.S. Empire–exposing racism and demanding change. Because he was effective, the ruling class demonized him, the FBI hounded him and the government expelled him. In that respect, he was a little like Colonel Gaddafi. Both refused to accept the old world order, both led movements that the challenged the U.S. government, both were hated and vilified by the ruling class. In both cases the U.S. sought a form of regime change to weaken or destroy the movements that they led. Just as we remember the anniversary of Marcus Garvey’s birth, let’s also remember what happened on this day August 19, 1981 when the United States invaded Libyan space and shot down two Libyan planes that were flying along the Libyan border in the Gulf of Sidra. Five years later in April 1986, President Reagan told all U.S. citizens to leave the country and ordered the bombing of Libya—targeting Gaddafi and his family, and engaging in terrorist bombing of civilian sites. Fifteen civilians were killed including Colonel Gaddafi’s daughter. These two events clearly show that the bloody attempt at regime change that we are seeing today didn’t start this year and it wasn’t a reaction to an alleged need to defend the people of Benghazi as the U.S. government would have us believe. It has been in the works for a long time. In fact, it has been an objective of U.S. policy and planning ever since 1969 when Gaddafi helped lead a movement that overthrew King Idris and then nationalized banks and oil companies and told the U.S. to get out of Wheelus Air Force base. Regime-change planning started when the Libyan people led by Gaddafi said “No” to imperialism and “Yes” to Libya belonging to Libyans. The U.S. ruling class motivation to get rid of Gaddafi was revealed by the contents of a June 4, 2009 cable from the U.S. Ambassador to Libya to the State Dept. in Washington, D.C. This cable was uncovered in the Wikileaks documents. The U.S. ambassador complained that Libya was able to force the huge French multinational oil company Total (with operations in 130 countries) to agree to a lower percentage of the profits by threatening re-nationalization. Among Total’s top shareholders are U.S. finance companies like BlackRock, T.Rowe Price, Allianz Global Investors of America and others. Libya has Africa’s largest oil reserves so it is a major target for oil companies and the finance capital. Add to that the U.S. drive to eliminate Libya as a center for funding and organizing political independence in Africa and the Middle East, and you have a deadly motivation for regime change. Standing in the way of regime change though is the question of whether the ruling class can get enough popular support to prosecute their war. Truth is of course one of the first casualties of war. But because they can’t get people to support war based on the truth of their aims, they have made up a story that if they didn’t act on March 18, 2011, if they didn’t begin bombing at that moment, then there would have been a massacre of Libyans that they could not tolerate. The day that they chose was significant. It was March 18, the anniversary of day bombing began in Iraq in 2003 (which by the way was a day ahead of a deadline given to Saddam Hussein to surrender). Let’s assume for the moment that the essence of the U.S. claim is correct. Let’s assume that the Libyan government decided that it was necessary to take Benghazi even if there were lots of civilian casualties in order to stop the U.S./NATO takeover of their country. Does anyone really believe that the U.S. rulers, the oil companies, the banks, the Pentagon and others really care about massacres, particularly in Africa? Massacres: Do the NATO powers really object to them? Hundreds of years of slavery and ripping the heart out of Africa gives a clue to the answer to that question, as does the government role in massacres of slave rebellions in the United States. After the 1884-1885 Berlin Conference that divided Africa among the European powers, Belgium imposed its rule on the Congo through indiscriminate killings and forced labor, killing 10 million people—half of the population—in 20 years time. On September 2, 1889, Britain killed 11,000 and wounded 16,000 Sudanese in one day as it tried to force its rule on the people of the Sudan. In 1904, Germany sent troops to Namibia to put down a revolt – killing 65,000 Herero and 10,000 Nama people- 80% of the population. It wasn’t until 2004 that Germany even acknowledged this genocide. From 1905 to 1907, German troops killed 300,000 in Tanzania in order to crush an uprising called the Maji-Maji revolt against colonial rule. In October 1911, Italy bombed Tripoli and landed troops to occupy it and take it as a colony. On October 26, the press reported that Italy massacred all people in one quarter of Tripoli, Libya due to an uprising against imperialist occupation, and shipped 1,000 others to a remote island to break the resistance. In March 1919, Britain arrested the leaders of the Egyptian nationalist movement and exiled them to Malta, but this only enflamed the struggle against imperialism. British troops killed 800 in that revolt that saw massive demonstrations by workers and students. The next month in India, British troops killed 400 and wounded 1,200 to stop a rally of 10,000 of Gandhi’s followers. In 1920 and 1921, there was a rebellion in Iraq against British colonialism. The British crushed it by killing 10,000 Iraqis. In 1929, British troops killed 30 Igbo women in Nigeria in a battle over colonial taxation. In 1930, Italy built a 200-mile long barbed wire fence along the Egyptian border to block guerilla supplies to freedom forces in Libya. Any contact with rebels was a crime with the penalty of death. In the same year Italy moved the entire population of Gebel, 100,000 people, to concentration camps on the coast. In 1931, Italy executed an 80-year-old Libyan resistance leader. They did it in the largest concentration camp – forcing 20,000 to watch in order to terrorize the population. By one estimate, Italy killed 12,000 people every year in this period to enforce colonial rule. In 1936, Italy invaded Ethiopia and claimed it as part of Italy—killing 8,000 and taking 4,000 prisoners in first part of their campaign. In 1945, French troops massacred Algerians–bombing villages and shooting people, and then tried to hide their crimes in a crematorium. Fifty thousand were killed. In 1949, there was a strike in the mines in Nigeria. British troops crushed it by killing 29 and wounding 51. The strike was an important part of a growing nationalist movement. In 1953 in São Tomé, Portuguese landowners unleashed a wave of violence—killing 1,000 who refused forced labor on the big estates (the Batepa massacre). This was the beginning of the nationalist movement and is today commemorated as a holiday. From 1952-1958 the British killed 11,000 Mau Mau freedom fighters–1,000 by hanging. Between 70,000 and 1 million were put concentration camps. In 1960 in South Africa, 69 were killed, 200 injured and 18,000 were arrested during protests against apartheid passes. In the same year, Portuguese troops killed 600 during a peaceful march for freedom in Mozambique. In 1961, a revolt against forced labor broke out in Angola; Portuguese troops killed 50,000. In 1964, President Johnson provided the four C-130 military transport planes that dropped Belgian paratroopers—thousands were killed killed in Operation that overthrew Peoples Republic of the Congo. In 1975, Cuban troops stopped U.S.-supported South African massacres in Angola. This is actually just a short selection of massacres committed by the United States and European powers in Africa. It leaves out the many massacres perpetrated by the United States and their puppets across Latin America—in Colombia, Cuba, Puerto Rico, Dominican Republic and Haiti. It leaves out the hundreds of massacres the colonial powers committed over the same period across Asia, from the Philippines to Indonesia, and India. It leaves out the 320 massacres (and that’s the Pentagon number!) carried out by U.S. forces in Vietnam, for which the generals, politicians and corporations responsible never served time. It leaves out the 2001 Dasht-i-Leili massacre where 3,000 prisoners were killed in Afghanistan, and the many massacres and killings by U.S. troops and Blackwater contractors in Iraq. Where in any of these killings and massacres was there any outrage by the imperialists? Did the U.S. or NATO feel compelled to intervene to stop a massacre or were they part of the problem? The U.S. government claims that it cares about massacres is ridiculous, but it is spun as truth by the big-business press and accepted by many who don’t know this history. These were war crimes. The U.S. war against Libya is a war crime. But it is not just about crimes abroad. War regiments society and restricts freedom based on appeals to patriotism and, if that doesn’t work, then police power. The freedom to speak and protest is restricted—see how the police frequently put people in pens when they protest now. Some people have no restriction on their voice—like the Missouri Chamber of Commerce, which wants to cap the minimum wage, and those who want to end collective bargaining rights. But those who want to insist on those rights, and those who want to challenge police brutality and racism, face lines of police. War takes youth—using them and then discarding them as GIs. War takes resources—resources that we fought for to fund vital social programs. At a time when the official unemployment rate in St. Louis is 9 percent and double that or more in the most oppressed communities, at a time when foreclosures are biting at the dreams many once had, we need more resources not less. But what we get is a budget that gives trillions for the military and budget cuts for the rest of us. Huy Pham, age 29, saw no hope after he was laid off due to budget cuts in Costa Mesa, California on March 17. Hours later he committed suicide. Stephanie Moulton, age 25, was killed on Jan. 20 by schizophrenic patient who needed to be in a hospital. But budget cuts were closing Massachusetts hospitals and transferring care to low-wage, no-benefit privatized care with insufficient funds for needed staff. She was the only staff on duty the day she was attacked. On May 30, Raymond Zach died from suicide that would have been stopped if budget cuts had not eliminated wetsuits and training. Without these resources, the firemen standing on the beach could only watch as Zach spent nearly an hour walking into deeper and deeper frigid water. These are tragedies that millions suffer in cities and rural areas all over the United States. It’s a tragedy because it doesn’t have to happen. As decisions are made to spend billions for war while cutting social services, it’s clear that the death and destruction from budget cuts is a political decision made for those who profit from war. The U.S. estimates the cost of the war in Libya at $1.1 billion for just 90 days—that is enough to save millions of lives here in the United States. Add to that the billions more for the wars for big oil in Iraq and Afghanistan and we begin to get a picture of a monstrous crime against humanity. It is a crime against the people here and abroad. While we fight for health care, education and pensions here, it is important to note that in Libya health care and education (even higher education) are free. Pensions are guaranteed by law at 2.5 percent times years of service times the average of the last 3 years of wage. Most workers in the United States don’t have guaranteed pensions, let alone a formula as good as that. Why should workers here fight to bring down a system in Libya that brought such benefits? Shouldn’t Libyan people be allowed to sort out their own problems by themselves without the intervention of a wage and benefit-cutting outside party? The ANSWER Coalition—Act Now to Stop War and End Racism—is a national coalition dedicated to fighting against war abroad and the war at home. For too long and for all of the wrong reasons, struggles here in the United States have been weakened by being separated – with the labor movement over here – not really mentioning the war and not really involved in a big way in the fight against racism, with the anti-war movement being over there and not being concerned with racism and injustice here at home. In the time of Marcus Garvey, there was a very significant anti-war movement in Missouri (during WWI) and there was a growing labor movement with many dramatic strikes in this area. But there was also vicious racist violence. It was a tragedy that labor movement and the anti-war movement did not act with force and effect to stand against racism. Formed in 2001, ANSWER is dedicated to acting on all fronts, in fighting wars abroad and cutbacks and racism at home. We see it as one fight and we are honored to be here tonight and we look forward to working with you in the future. We are very honored to be on a stage with leaders in the movement who really understand the system, who know how to expose it and who are dedicated to the struggle to end injustice. Thank you for having us here.